The government and the opposition do battle as ordinary Venezuelans weather an economic crisis. Coups and countercoups. Crackdowns. Economic crackups. Seven cents for a tube of toothpaste and $755 for a box of condoms. As a result of the latter, Bloomberg says, “Venezuela has one of South America’s highest rates of HIV infection” (disturbing, and, Bloomberg didn’t mention, exactly the same rate of HIV infection as in the United States). Falling oil prices. The arrest of an opposition leader. Washington plots. Human Rights Watch tweets. South America rallies. What is going on in Venezuela? I have no idea. I’ve been too busy trying to track down the cameraman who accompanied Bill O’Reilly to El Salvador, where he didn’t report on the El Mozote massacre. So I asked a trusted panel of experts. Here’s what they say. Above all, Miguel Tinker Salas, a professor of history at Pomona and author of The Enduring Legacy, a history of the Venezuelan oil industry, insists we have to keep perspective. Mexico, where the bodies pile high and the country is in the middle of a humanitarian crisis of staggering proportion, gets a “free pass” by the United States. Not so much Venezuela (where things might be bad but not 83,000-corpses bad). Reporting on Venezuela in the US, and depictions of the country by the Washington political establishment would lead anyone to believe that the country is once again on the verge of a precipice. The recent death of a student in Venezuela is tragic. But unlike in Mexico where impunity reigns, the policeman responsible for the student’s death was immediately arrested which didn’t stop the state department and Secretary of Kerry from issuing a rebuke [Editor’s Note: compare Venezuela’s Interior Minister Carmen Meléndez response to the killing of Kliver Roa with recent events in Ferguson, Staten Island, Cleveland….) In the current context, the government of Nicolas Maduro in Venezuela is depicted as losing popular support and purportedly relying on repression to stay in power (again, compare with Mexico). Sensational headlines typically focus on the lack of toilet paper and condoms as a way to ridicule the country and the political leadership that was elected after Chávez’s death. In Mexico, where over 50 percent of the population lives in poverty, and millions of poor and indigenous people lack access to food, or basic services, deplorable conditions go unremarked. Millions either emigrate or become displaced, and the tens of thousands of deaths are blamed on the drug cartels, thus absolving the US ally and financed government of responsibility. Most reporting seldom acknowledges the fundamental political and social change that has occurred in Venezuela in the past fifteen years or the empowerment of millions of people. The future in Venezuela is unclear and the crisis deep, and dissatisfaction has grown, yet the government still retains support. many of those poor barrio residents who make up the stronghold of the Bolivarian process are aware of the destabilizing role being played by the opposition on many fronts and are not the core of those expressing discontent. And speaking to ordinary Venezuelans, one does not get the sense of major economic calamity, despite hardships. The bonds of solidarity that have developed in recent times have given rise to such innovative responses as a barter economy. Constant pressure has narrowed spaces for reflection, constructive criticism and redress. In the midst of the economic crisis, state funding for community media initiatives has been greatly reduced. Catia TVe, a prominent community television station in Caracas, has cut its staff by half. The steadily diminishing reach of their minimum wage pay means that everyone must hold down multiple jobs. As elsewhere in Venezuela, new disparities have emerged between those who have access to dollars—via family abroad, through international travel, or other channels. But rather than abandon the project of building Bolivarian socialism, many barrio-based media producers continue to make television and radio towards the aim of constructing a more just and equal social order, seeking to do what they can with very limited resources. Even while they are frustrated with corruption and mismanagement and skeptical of some claims put forth by the Maduro government, they remain convinced, that if the opposition should gain power, their social and economic conditions would be far worse. Chavismo has always been internally divided, with multiple conflicting currents—some more committed to participatory democracy and building a communal state than others. 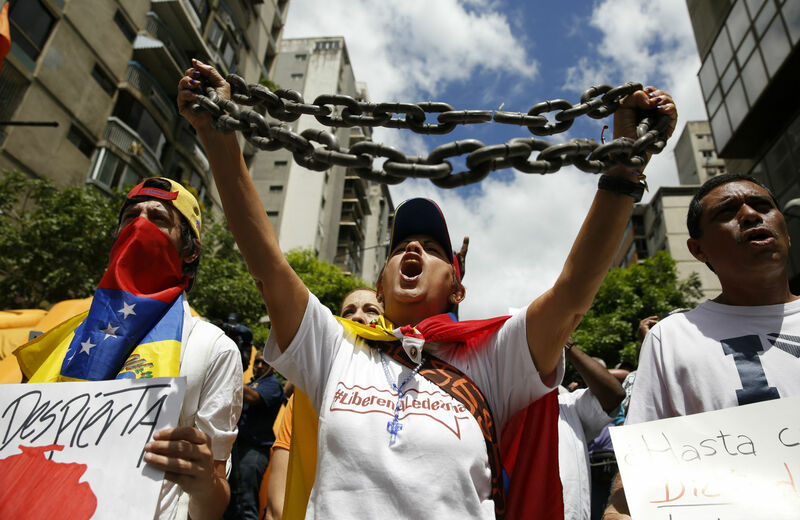 Over the years, poor Venezuelan Chavistas, Schiller says, echoing Fernandes, have proven remarkably resilient and active in taking control of their lives, to the best of their ability. Supporters of Chávez and now Maduro are often depicted as “unproductive ‘clients’ who expect handouts in the form of subsidized food and irrationally cheap gas prices” (tropical versions of Romney’s 47 percenters). But, she says, the “Bolivarian movement has been built by people who have used state funds to educate themselves, build alliances, participate in local governance, feed their neighbors, make their own media, and care for the sick. They have sought to transform oil dollars into thriving communities.” That model might no longer be sustainable. As long as the people in the barrios do not join protests, the Maduro government will most likely not fall. But whether the Chavista base in the cities will turn out and vote for the PSUV in [scheduled National Assembly elections] December, despite the party’s superior organization, is much more problematic…. While the government may ultimately come up with hard evidence against [Caracas mayor Antonio] Ledezma, concern about his arrest [on charges of sedition] is not limited to the opposition. ‘Criminalization of dissent,’ as some commentators call it, is increasingly of concern to the left wing of Chavismo too. the discourse of leading members of the Venezuelan opposition is deliberately vague, but their intentions are obvious. They engage in what President Maduro calls a “double band”: they swear support for peaceful solutions but at the same time encourage a non-democratic path to power along with disruptive and even violent tactics. From February to May of last year the dual approach served to justify widespread anti-government disruptions, which included mass destruction of state property and numerous deaths including six National Guardsmen. The slogan “exit now” (first launched by the now jailed Leopoldo López) was a euphemism for regime change by any means, even while opposition leaders claimed they were simply pressuring President Maduro to resign. (The very same leaders had called on Chávez to resign in the weeks leading up to the April 2002 coup.) In another example of intentional ambiguity, the opposition insisted on the liberation of “political prisoners” jailed during last year’s protests, without distinguishing between peaceful and violent protesters. Now opposition leaders are calling for a “transition” away from the current government in order to hold new elections, revamp the public administration, negotiate with multilateral financial agencies, review the expropriations of companies by the Chavista government, free “political prisoners” and significantly increase oil production (in apparent violation of OPEC quotas). The Maduro government claimed that the proposal to form a transitional government was linked to a coup plot involving Air Force officers as well as Caracas mayor Antonio Ledezma, who it jailed as a result. If the real aim of these opposition leaders is to pressure Maduro to resign, why don’t they confine their slogans to references in favor of that objective? All Venezuelans know that Maduro, who counts on considerable mobilization capacity and the nation’s largest and best organized political party, is not about to resign. The non-electoral road to power necessarily involves violence and eventually a military coup. For 15 years, most of the western media has been saying that the Venezuelan economy was on the verge of collapse. This was the analysis in much of the business press even when the economy was booming and inflation was under control. Are they finally right? Inflation was 68.5 percent for 2014, and Venezuela’s GDP shrank by 2.8 percent. The economy has also been plagued by shortages of consumer and other goods, including some medicines. Venezuela’s government bonds carry the highest interest rates in the world. Clearly there are serious problems that need to be resolved. The inflation and shortages are mostly a result of a dysfunctional exchange rate system. A cut in the supply of dollars in the fall of 2012 set in motion a spiral in which the black market rate rose, pushing up inflation, which in turn pushes the black market rate further. There are currently two fixed rates (6.3 bolivares Fuertes, or Bfs, per dollar for food and medicine, and 12 Bfs for some other goods) and a new floating rate that began trading on February 15 , in addition to the black market. An adjustment needs to take place to push the price of dollars to a level that will eliminate the excess demand. The new floating rate announced last week is currently at about 172, not far from the black market rate of 191 for cash transactions. It remains to be seen if this new foreign exchange market will arrest the process of the inflation-depreciation spiral— and the capital flight that comes with it—and whether it could be a step toward unifying the exchange rate. The problems are resolvable. In the past two years, Venezuela has cut imports by 33 percent, almost as much as Greece has done with 6 years of depression. So the hardest part of an adjustment—even taking into account the fall in oil prices—is done. According to Bank of America’s estimate, Venezuela has reserves and assets that it could turn into cash totaling $70 billion, or more than one and a half times the level of annual imports. With just the government’s gold reserves it could buy up all of the government and PDVSA (the national oil company) bonds that come due in the next three years; a debt default is therefore extremely unlikely. In short, Venezuela’s economic problems are fixable, but to fix them serious reform is needed—most importantly in the exchange rate system. Under Chavismo, we went from a deregulated economy, in the hands of the private sector, to state capitalism sustained by the appropriation and redistribution of oil revenues to the underprivileged. Notwithstanding the profound social and egalitarian nature of the policies implemented during this period…what we see in Venezuela today are signs of the exhaustion of the rentier and statist economic model. At the same time, we have witnessed shortages and the dismantling of the productive apparatus. In this context, the ruling classes and their political organs, the parties of the right, seek to restore their power. In the economic sphere they demand liberalization and the monopoly of oil revenues. Politically, the ruling class seeks to overthrow the Bolivarian project and impose a neoliberal government to serve their interests. weak and embattled. Without the strong leadership of Chávez, who held together a heterogeneous political field and gave it a clear strategic direction, the current cabinet has not been able to set a clear path of action and has postponed decision-making. This indecision, in part, indicates its desire to avoid taking steps that would harm the poorest—steps which conservative sectors advocate—such as devaluing the bolívar, ending price controls and reducing social spending. The Bolivarian project is at a crossroads. The exhaustion of both the rentier model and the development model of state capitalism demands that it either take a neoliberal turn by deregulating the economy, in which the wealth of the nation would return to the wealthy, or—taking advantage of the disillusionment with the rentier model—advance towards a post-capitalist model in which productive capacities are socialized in the hands of the people. But with all this emphasis on the towering heights of the economy and the national conflict between Chavistas and anti-Chavistas, we run the risk of losing sight of what is always lost sight of: the historically poor, the revolutionary grassroots, those who knew shortages and insecurity long before wealthy elites raised these as banners; those who know the dangers and corruptions of state power but have opted to vie strategically for it nonetheless. While supporting Nicolás Maduro and the continuity of the Revolution, many have thrown their weight behind the construction of a parallel, communal “state,” contributing their efforts to an expanding network of self-governed communes. These communes, while only just beginning to emerge, are producing goods as they produce new people and new political relations. As one communal organizer recently told me: “This is the most difficult moment of the Bolivarian Revolution, but the communes are where the vitality is.” Vitality will only get us so far, however, and it is unclear whether or not the political will exists to drive forward the communal project: too many Chavista political elites have too much to lose if the communes succeed. But perhaps the economic crisis will override: the private import sector has proven to be the government’s Achilles’ heel, and communal production is far more efficient than state-managed farms and factories. Venezuela is at a tipping point: too socialist to thrive in the global system, still too dependent on capitalism to break with it. The only way out is forward, and the only way forward is through the commune.